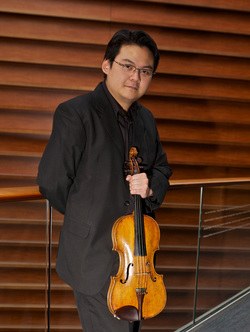 Violist Che-Hung Chen has been a member of The Philadelphia Orchestra since the spring of 2001, when he was hired by then music director Wolfgang Sawallisch, becoming the first Taiwanese citizen ever to join the Orchestra. He has also served as Acting Associate Principal Viola under former music director Christoph Eschenbach. Mr. Chen was the first-prize winner at the Seventh Banff International String Quartet Competition as the founding member of the Daedalus Quartet; The quartet was also awarded the Pièce de concert prize for the best performance of the commission work, and the Székely Prize for the best performance of a Beethoven quartet. A three-time top-prize winner at the Taiwan National Instrumental Competition, Mr. Chen is a graduate of The Curtis Institute of Music, where he studied with the legendary Joseph dePasquale. His other teachers have included Ben Lin and Toby Appel. Mr. Chen has served as principal violist of the Curtis Symphony Orchestra, and has recently appeared as guest principal violist with Japan’s Hyogo Performing Arts Center Orchestra, San Diego Symphony, and the Saint Paul Chamber Orchestra. Mr. Chen’s recording of Chiayu Hsu’s “Twelve Signs” for solo viola with the Naxos Label is set to be released in 2015. ​As a vivid chamber musician, Mr. Chen was a participant at the Marlboro Music Festival, performed on their fiftieth anniversary concerts in Boston and New York's Carnegie Hall, and participated in several “Musicians from Marlboro” national tours. Performing annually at the Kingston Chamber Music Festival in Rhode Island with his wife, pianist and artistic director Natalie Zhu, Mr. Chen has also participated in festivals such as Ravinia, Caramoor, Saratoga, Bridgehampton chamber music festivals and Music from Angel Fire. With Ms. Zhu, Philadelphia Orchestra colleague First Associate Concertmaster Juliette Kang, and cellist Thomas Kraines, they have founded the Clarosa Quartet, dedicated to exploring and enriching the piano quartet repertoire. Mr. Chen currently serves on the faculty of Temple University’s Esther Boyer College of Music and its Preparatory Division. He performs on a viola made by Carlo Antonio Testore in Milan, Italy, c. 1756.